Almost certainly commissioned for 19 Arlington Street, London by either Thomas Dundas, 1st Lord Dundas (d. 1820) or his son, Lawrence Dundas, 1st Earl of Zetland (d. 1839) and thence by descent. A. Bolton, '19 Arlington St. S.W. ', Country Life, 17 September 1921, p. 351. E. Harris, 'The Moor Park Tapestries', Apollo, vol. LXXXVI, September 1967, pl.2, p.183. A. Coleridge, 'Sir Lawrence Dundas and Chippendale', Apollo, vol. LXXXVI, September 1967, pl.III, p.197. 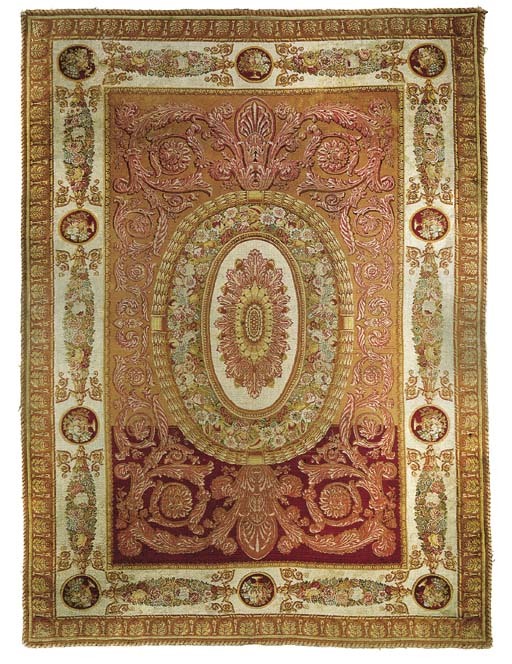 There is a record in the Zetland archive dating from 1765 for a carpet designed by Robert Adam which was commissioned by Sir Lawrence Dundas for 19 Arlington Street from Thomas Moore's Company in Moorfields (Stillman, Damie: The Decorative Work of Robert Adam, New York, 1966, p. 50). In his article on the subject of Sir Lawrence Dundas and Chippendale, also noted above, Anthony Coleridge suggests that the present carpet was commissioned for the house from Moore, and probably designed by Adam. It must be admitted that the proportions of the design of the carpet echo very well the compartments of the Salon ceiling at Arlington Street, which serves to indicate that it was made for that room. The present carpet however lacks the coloured warp every ten, a technical characteristic of the products of Moorfields which was borrowed from the French Savonnerie carpets. It is also of a design rather heavier and denser than one would expect from Robert Adam. In her recent work on the subject Sarah Sherrill states that the Adam/Moorfields design carpet no longer survives (Sherrill, Sarah B.: Carpets and Rugs of Europe and America, New York, 1995, p. 175 and note 157, p. 414). There are two very closely related carpets to the present example which have been published, all three of which must have been made in the same workshop. One, the most similar, was in the Yellow Drawing Room at Rudding Park, Harrogate which was commissioned by the Hon. William Gordon in 1807. It was sold in situ by Christie's as lot 256 on 16 October 1972, illustrated as pl. 49. That example has a circular central medallion flanked by identical scrollwork to that seen here, but with an extra band of scrollwork at each end. The ivory border also has identical swags but lacks the roundels of the present carpet. The second was at Devonshire House, London, before its demolition (Tattersall, C.E.C. : A History of British Carpets, Benfleet, 1934, pl. XIXB). That appears to be the smallest of the three, with a central roundel flanked by scrollwork squashed into the end panels, again within a white border of identical swags, this time linked by different roundels. Of the three carpets it is probable that this was the first to be commissioned. Each end of the Rudding Park carpet has the extra panels of acanthus within the field, rather than redesigning the entire acanthus to fill the space. The end panels of the Devonshire House carpet are somewhat cramped by the scale of the medallion and the border panels are obviously contorted to fit the space correctly. The date of the furnishing of the Yellow Drawing Room at Rudding Park gives a very probable approximate date for the commissioning of that carpet (see note to lot 166). This was at some time between 1807, when the room was commissioned, and the six years following 1823 when the majority of the contents were purchased. As the present carpet must be earlier than the Rudding Park example (see above), this give us a terminus ante quem for its manufacture. The design clearly derives its influences from Savonnerie carpet designs reflecting the heavier French taste popularised by the Prince Regent, notably at Carlton House (see the preceding lot). Closely related scrollwork, roundels and swagged flowers can be seen on drawings that were created by Saint-Ange for the Savonnerie manufacture under Napoleon and Louis XVIII (Dumonthier, Ernest: Dessins de tapis et tapisseries du mobilier de la couronne, Paris, n.d.). Yet the carpet is still an English interpretation of the designs from France. The border in particular has a softness of colouring which is absent from the Saint-Ange illustrations, and is much more in keeping with the English interior. The way the design is subtly changed from one carpet to the next also indicates an Axminster origin. Thomas Whitty recognised the popularity of some of his designs and reproduced them, sometimes with slightly different colour schemes, or with slightly differing design details, a number of times (see note to the following lot). His commercial acumen thereby avoided the need and expense of a completely new cartoon for every carpet he produced. This is probably one of the reasons why his factory managed to continue long after his rivals in Exeter and Moorfields had had to close. And what better way to sell the idea of a carpet to a new client than to say you can make them one just like that recently produced for Lord Dundas' very fashionable interior at Arlington Street.